FILE - An American flag is seen flying in front of the dome of the United States Capitol building, July 26, 2011. The move to alter some key aspects of the Dodd-Frank law has overwhelming Republican support and enough Democratic backing that it's expected to gain the 60 votes necessary to clear the Senate. Several Democratic lawmakers facing tough re-election races this year have broken ranks with Minority Leader Chuck Schumer, D-N.Y., and Senator Elizabeth Warren, D-Mass. 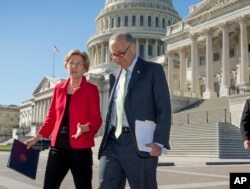 FILE - Senator Elizabeth Warren, D-Mass., left, and Senate Minority Leader Chuck Schumer, D-N.Y., walk to a news conference at the Capitol in Washington, Wednesday, Oct. 18, 2017. "There is no reason at all to roll back the rules on these big banks so they can pad their pockets even more — and cut them loose to take on wild risks again," wrote Warren, who before joining the Senate led a congressional oversight panel for the bailout programs. 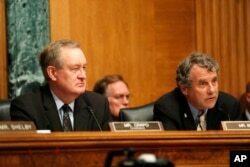 The Senate bill emerged from lengthy negotiations between Senator Mike Crapo, the Republican chairman of the Senate Committee on Banking, Housing and Urban Affairs, and Democratic members on the committee. The ranking Democrat, Senator Sherrod Brown of Ohio, said the changes go too far and he walked away. FILE - Senate Banking Committee Chairman Senator Mike Crapo, R-Idaho, left, and the committee's ranking member Senator Sherrod Brown, D-Ohio, listen on Capitol Hill in Washington, July 13, 2017. This cycle, commercial banks have targeted their campaign donations to major players on committees with jurisdiction over banking issues, including the incumbent senators in competitive races: Among the top 10 recipients of commercial bank donations are Democratic Senators Heidi Heitkamp of North Dakota, Joe Donnelly of Indiana, Jon Tester of Montana and Republican Senator Dean Heller of Nevada. All four are co-sponsors of Crapo's bill.